There were at least three or four opportunities throughout the game where the Concordia receivers couldn’t come down with the ball after quarterback Terrance Morsink supplied seemingly-catchable passes. The win gives the Stingers some security as playoff contenders—they currently sit fourth in the Quebec University Football League standings. The same cannot be said for McGill, despite the fact that the team recorded 371 yards of total offence to Concordia’s 183. After a scoreless first quarter, McGill took the lead early in the second. Putting an end to a drive that included 43 rushing yards from Redman Taylor Kuprowski, kicker Austin Anderson powered a field goal through the uprights from 18 yards out. Concordia then went down 5-0 after conceding a safety. Deep into the second quarter, Morsink decided to take matters into his own hands to score the game’s opening touchdown. Following an incomplete pass to Michael Harrington on 1st and 10 from McGill’s 19-yard line with 1:47 to go, Morsink elected to run on 2nd down and found space on the left side for a 16-yard gain. Running back Edem Nyamadi was then stuffed on the line before Morsink, absorbing a huge hit, punched the ball into the end zone to give Concordia a 7-5 lead at halftime. Kuprowski would regain the lead for his team at 9:11 of the third, accepting the handoff from QB Ryne Bondy and finishing his team’s drive with a 1-yard touchdown run into the end zone. McGill went for the two-point conversion, but Bondy rifled a pass right into Stingers cornerback Kris Robertson’s arms. Concordia punter Dumitru Ionita put his team within three points minutes before the third quarter ended, as his long punt crept through the end zone for a single. 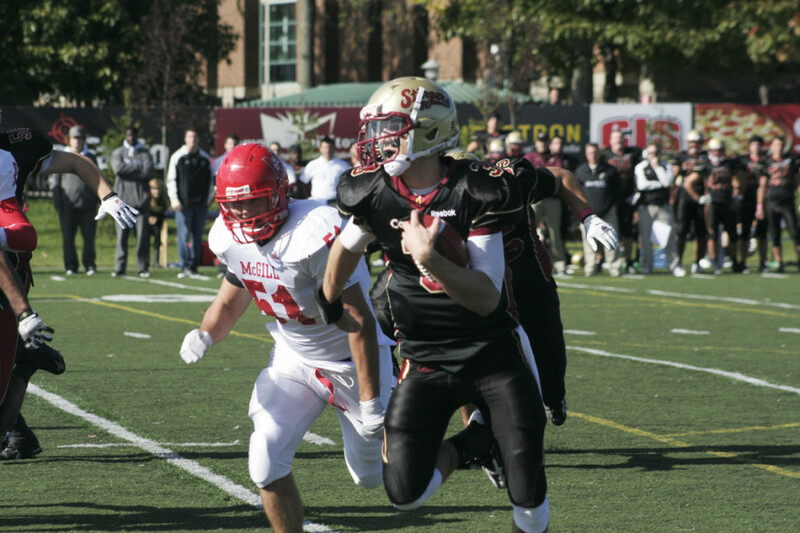 The Stingers took over in the fourth quarter, as linebacker Alex Lemire recovered a fumble by Kuprowski at his team’s own 29-yard line. Morsink then ran on 2nd and 10 and once again came up with another 16-yard gain. He then completed the drive with a 13-yard touchdown pass to Harrington, but kicker Rene Paredes had his convert blocked. Concordia running back Michael Donnelly made his mark on the game, recording a seven-yard touchdown run to cap a late drive with 5:58 left. 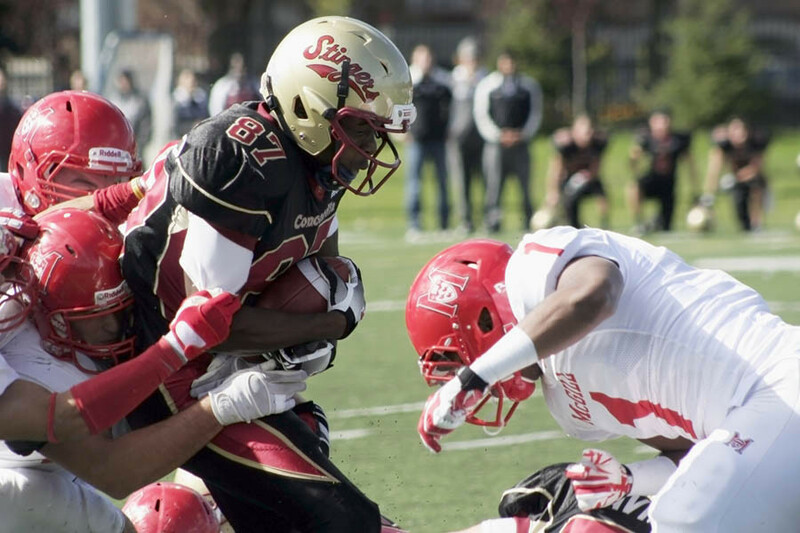 The football team’s next encounter will be at the Université de Sherbrooke Oct. 16 at 1:00 p.m. This article originally appeared in The Link Volume 31, Issue 09, published October 12, 2010.